On the morning of 16th July 1816 a number of Warsop men, accompanied by various youngsters, assembled at the top of Cuckney Hill. They divided into two groups: one headed west along the parish boundary towards Langwith; the other followed the boundary eastwards towards Budby. 196 years later another group of local folk retraced their steps along the part of the boundary that passes through the woodlands of Birklands. 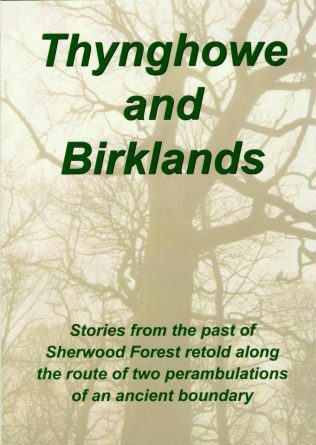 This account describes these two perambulations and tells many stories from this part of Sherwood Forest, covering over a thousand years of history. Read how trees, stones, humps and hollows reveal secrets about the kings, dukes and common folk who left their mark on the Forest. Published by The Friends of Thynghowe, May 2013, 58 pages with colour photographs and map. This booklet may also be available for loan from several local libraries.